Monster Pro 2000 pro audio cable's advanced coaxial design preserves fast transients, clean highs, and vivid harmonics. Patented multiple gauge wire networks enhance your guitar's sonic bite, maximizing your guitar's tone and helping it through the mix. 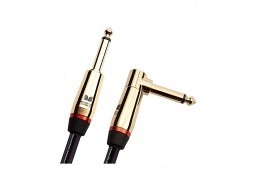 A dense shield rejects interference and hum, and heavy-duty 24k gold connectors increase conductivity and resist corrosion. Monster set the standard with the Original Lifetime Cable Warranty. Monster Rock® pro audio instrument cable is covered with by 100% replacement guarantee, so you'll be a Monster for Life! Carbon-Infused Polymer minimizes handling and vibration noise.